The Felidae family is a part of the order Carnivora within the mammals (Class Mammalia). Members of the family are called cats or felids, and sometimes felines, although this latter term is more precisely used for members of the subfamily Felinae. They number about 41 species including large animals such as the lion (Panthera leo) and the tiger (Panthera tigris), as well as smaller ones such as the bobcat (Lynx rufus) and the domestic cat (Felis catus). Some cats present a threat to domestic animals, even to humans in the case of the big cats. For such reasons, as well as for sport and fur, cats have been a target of hunters and trappers. Because of such hunting, combined with loss of suitable habitat and other causes, most species are now considered to be be endangered in the wild. Yet, as with all animals, species within Felidae provide a larger benefit to the ecosystem and to humans while pursuing their own individual purpose of survival, maintenance, and reproduction. Ecologically, as apex predators at the top of food chains, they play an important role in keeping populations of prey species under control, and thus aiding the balance of nature. Cats also are a large part of people's fascination with nature, with their appearance and behaviors creating aesthetic delight and wonder, whether being viewed in nature, in zoos, or in media. 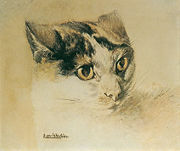 The domestic cat is a popular companion in people's homes and has historically benefited their hosts by killing rodents. Cats are admired for their beauty, their grace, and their seemingly mysterious ways, and they have often been featured in art and legend. Like most other members of Carnivora (carnivores), cats mainly get food by killing and eating other animals. They are more strictly carnivorous (meat eating) than most other carnivore families. Bobcats and some other cat species supplement their meat diet with fruit. The teeth of cats are well suited to their diet, with long canines for gripping prey and blade-like molars for cutting flesh (Voelker 1986). All cats walk on four feet, in a digitigrade manner—that is on their toes. Their hind legs are longer and stronger than their fore legs, which gives them strength for sprinting and leaping, but not stamina for long distance running. Cats have claws on their feet that are used for gripping prey, for fighting, and for climbing. 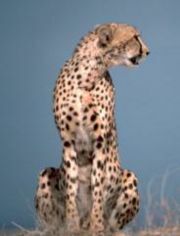 In all cats except the cheetah (Acinonyx jubatus), the fishing cat (Prionailurus viverrinus), and the flat-headed cat (Prionailurus planiceps), the claws can be retracted into the toes, which helps keep them sharp. Most cats have a long fur-covered tail, which is used for balance in running and leaping, and sometimes for warmth. The bodies of all cats, except some breeds of domestic cat, are covered with thick fur. In most species, this is spotted or striped. Cats have very keen senses, especially their vision. Their eyes are large and are well suited for seeing in low levels of light. Most cats hunt at night or in the late evening and early morning. They can not, however, see in total darkness. With a few exceptions, most notably lions, cats live most of their lives alone. Male and female cats come together to mate, which in most species happens once a year. The young are born in litters of one to six. They are cared for by their mother for several months, until they are mature and experienced enough to live on their own. The cat family is usually divided into the "big cats" of the subfamily Pantherinae and the "small cats" of the subfamily Felinae. 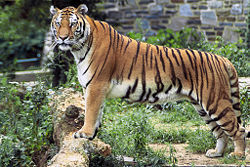 The largest cat is the tiger (the subspecies Siberian Tiger), which can weigh as much as 250 kg (550 lb). The smallest cat is the black-footed cat of southern Africa (Felis nigripes), which weighs about 1.5 - 2.75 kg (3.3 - 6 lb)(Nowak 1983). 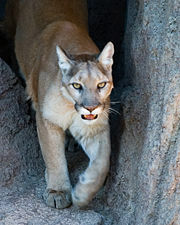 Some "small cats," for instance the cougar (Puma concolor), can weigh as much or more as some of the "big cats." Ligers, crossbreeds between male lions (Panthera leo) and female tigers (Panthera tigris), which can weigh more than 450 kg (1000 lbs), are the largest cats in the world if hybrids are included. (A similar, but smaller hybrid, the offspring of a male tiger and a female lion, is called a tigon. Cats are found in the wild in most land environments, on all continents except Antarctica and Australia (except for feral domestic cats). Some species of cats are native to tropical rainforests, grasslands, deserts, temperate forests, and high mountains. Cats, like other predators, play an important role in keeping the populations of prey species under control so that excessive damage to plants is avoided and the balance of nature is preserved. Among the animals preyed upon by cats are rodents, birds, reptiles, and in the case of the larger species hoofed animals. Lions have been known to prey on African elephants, the world's largest land animal. The fishing cat of Southeast Asia is a good swimmer and eats mainly fish. Feral cats—domestic cats that have returned to the wild—are a problem in many areas of the world and have caused the extinction of some native species of birds and mammals (ISSG 2007). To humans, the most important cat is the domestic cat, which is descended from the wild cat (Felis sylvestris). Since the time of ancient Egypt, domestic cats, or their wild cat ancestors, have shared the homes of humans and have greatly benefited their hosts by killing destructive rodents. Domestic cats are now one of the most popular pets and are common all over the world. Although most cat species are beneficial to humans because of their role in nature, some present a threat to domestic animals and, in the case of some of the big cats, to humans themselves. For this reason, as well as for their fur and for sport, cats have been hunted and trapped. Most cat species are now considered to be endangered in the wild (IUCN 2007). In general, cats are admired by humans for their beauty, their grace, and their seemingly mysterious ways. They have often been featured in art and in legends and folktales. Cats are often used in advertising and as mascots for sports teams and military units. The oldest known true felid (Proailurus) lived in the Oligocene and Miocene eras. During the Miocene, it gave way to Pseudaelurus. Pseudaelurus is believed to be the latest common ancestor of the two extant subfamilies, Pantherinae and Felinae, and the extinct subfamily, Machairodontinae. This group, better known as the sabertooth cats, became extinct in the Late Pleistocene era. It includes the genera Smilodon, Machairodus, Dinofelis, and Homotherium. Genetic research gives a more concise classification for the cat family (Johnson et al. 2006; Wozencraft 2005). Invasive Species Specialist Group (ISSG). 2007. Global invasive species database: Felis catus. Invasive Species Specialist Group Website. Retrieved June 14, 2007. IUCN Species Survival Commission (IUCN). 2007. ICUN Red List of Threatened Species: Felidae. International Union for Conservation of Nature and Natural Resources. Retrieved June 14, 2007. Mott, M. 2005. Cats climb new family tree. National Geographic News January 11, 2006. Retrieved June 14, 2007. Shoemaker, A. 1996. Taxonomic and legal status of the Felidae. Felid Taxonomic Advisory Group of the American Zoo and Aquarium Association. Retrieved July 15, 2006. This page was last modified on 7 June 2011, at 01:55.